TWO more musicians have expressed their frustrations with the post-label era of music distribution, which many technologists tell us is the best of all possible worlds. The first is the estimable eclecticist Van Dyke Parks, who writes in the Daily Beast about “How Songwriters Are Getting Screwed in the Digital Age.” (I know Van Dyke well enough to know that that was not his headline.) He’s writing specifically about the low royalty rates musicians (especially songwriters) make from Spotify and the like, but sees the crisis as part of a larger battle. 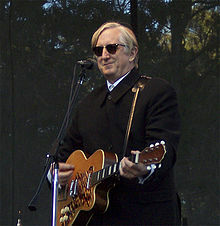 is by producer T-Bone Burnett, known for his work in television (Nashville) and film (the Coen Brothers movies.) His piece is largely about a lawsuit over whether musicians who recorded before 1972 will earn royalties on their work, since national copyright did not exist then. The streaming services and Internet radio are trying to avoid paying anything. Several lawsuits have been filed over the last year on behalf of artists and copyright owners against Pandora or Sirius XM to rectify this disregard for what legacy artists created. It turns out that recordings made before 1972 are protected by state law and newer recordings are protected by federal law. It’s a distinction that matters to lawyers but not to those who make music for a living — or their fans. And why should it? These issues are central to my book; I get into them in some detail then. And I’ll be writing over the music-streaming fight in the near future. UPDATE: British folk/punk Billy Bragg and Ed O’Brien of Radiohead have just spoken out about what they describe as YouTube bullying indie labels for their upcoming streaming service. Story here. And here is David Carr’s assessment of the high price of “free” music in the New York Times. “The outbreak of free is being felt all over the economy,” he writes, “but music is an industry that has produced the soundtrack of contemporary American life. Artists are singing the blues about the crippling effects of streaming, and no one wants to be part of the day the music died.” He contrasts the way educated urbanites are now willing to pay high prices for produce and other kinds of food, but balk at paying a dime for culture. Musicians are getting killed, no doubt. Copyright laws and trade agreements are written for large commercial enterprises, always while invoking the solemn right of “creators” to get paid. Now we are in danger of losing the one-speed-for-all Internet. We need more and better and more powerful voices for creative artists; meanwhile, the urge to “pirate” content is strong, given that all of us are paying thousands of dollars a year just to access the sites where the content resides, while in our towns the stores where we used to buy content are disappearing. I’m not sure what the solution is, but trying to charge consumers more for something they can readily steal is an unlikely path to prosperity and happiness for anyone.